You know the problem - you're walking down the street, carrying shopping and someone rings. What do you do? Well, in the future: wiggle your eyes. NTT DoCoMo - the Japanese network that's also got a thoroughly great line in working out the next generation of technology - has managed to make a pair of earphones that can sense eye movement and control your mobile phone. 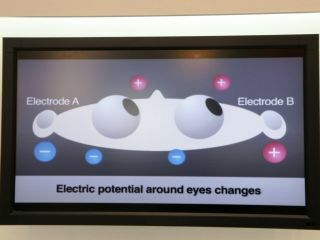 The concept works through small electrodes that can sense when your eyes are looking in a certain direction, leading to impulses the headphones can read. The idea is that when you look up, your eyes emit a small amount of positive electrical potential, and when you look down, a negative amount. The headphones have small electrodes that can read these impulses and turn them into commands for a mobile phone. This means that when you move your eyes in a certain way, you can tell your phone to call someone, pick up or even change the music playing. Guess what? There's no UK release date for this crazy tech. In fact, we'd bet we'll never hear about it again - which is a sad thing, as we love the idea of looking both ways to cross the street and accidentally calling our mum.